I feel ambivalent about this story. It has good points, and bad points, and overall, I don't have a strong feeling about it. Well, I suppose it would help if I narrate what the story is about. So, the novel begins by narrating the life of Joel, who is this young man, a child of a rabbi, and he goes to yeshiva school. Now, the weird thing about Joel is that there are plenty of weird things that occur around him. In the story, there was this incident where his parents are arranging his marriage to another Jewish woman, and he ends up being propositioned by seven women, all sisters, and they argued that it would be better if Joel marries all of them. So that was bizarre. And then Joel starts having mental problems. He faints in a fish market, and that becomes gossip fodder for the whole Jewish community in Rockland county, and then his parents become worried about his marriage prospects. They think that the fainting incident becomes bad image with respect to his personality. Joel also becomes weird and obsessed with the alphabet, and this mainly concerns the Jewish prohibition of speaking God's name in vain, so he tries all these little permutations about pronouncing the four-letter Jewish word using various variations. Then Joel dies in the middle of the story. The story then shifts to JakobJoel, who is the son of Ada (Joel's sister) and Aaron (Ada's husband and Joel's best friend). JakobJoel is born after Joel dies, and he is characterized as one who initially went to Jewish school as well, but decided later on that he wanted a secular education, by transferring to the local public school. He later gets accepted to MIT and he studies artificial intelligence. There, he encounters Cog, a robot that his laboratory is trying to embody with human emotions. Now JakobJoel becomes weird too. He hears his dead uncle. He develops this obsession about finding things about his dead uncle. 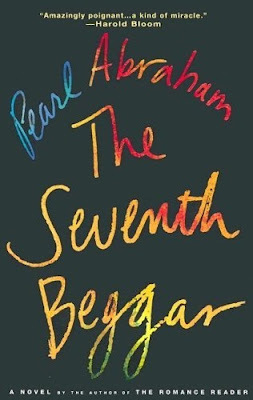 And in a section of a book, where it wasn't really clear what happened, it seems that he had a hallucination and the time line was disrupted to create this parallel story within a story, where it recounted the story of lost children in the forest that were helped by seven beggars. This is where the title of the novel stems from. Anyway, I liked the novel until Joel died. I always wanted to know why novels are titled the way they are titled, and yet for the longest time, this was unclear. Is the novel about Joel? About JakobJoel? About Joel and his weirdness and his influence on the living? About Jewish life in Rockland County? I am not really sure. This novel was interesting in the local level (I loved and appreciated the narrations and the mini-stories) but not at the global level. I never saw how the small vignettes of Joel's life and JakobJoel's life related as a coherent whole. So, like I said, I am ambivalent with this. I don't think I would recommend this to others. I give it 2 out of 5 stars.